How not to dim EL panels, TRIACs! We’ve all been there: an exciting brilliant idea, scratched onto a napkin, hastily plugged into a breadboard, all for naught. Even the best ideas sometimes suffer from a heavy dose of reality. [Ch00f] over at ch00ftech recently had a similar experience dimming an EL panel of his using a TRIAC and some clever waveform manipulation. Instead of tossing the parts across the room in a fit aside and moving on he goes into a detailed analysis of what went wrong. 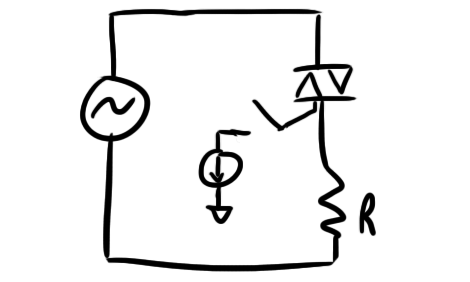 This method differs from the way most EL drivers dim output loads, instead of chopping the output like a PWM controlled LED the TRIAC snips the ends of the waveform and makes an ugly but less powerful output. The issue with this method is that when you cut the waveform during non-zero crossings it causes massive current spikes. These can wreak havoc on a cheap EL inverter and generally cause headaches all around. [Ch00f ] speculates that his woes may be due to the fact that EL wire is a capacitive load, causing voltage to fall out of phase with the current. This is one of those engineering problems with a thousand and one answers, we can’t wait to see what he comes up with. Check out the writeup for all the “deets” (as [ch00f] would say) as it is a pretty good primer on TRIAC operation. If there isn’t enough glowy wire in this post you can also check out this sound reactive panel or an informative guide on EL or even more from [ch00f] in general.